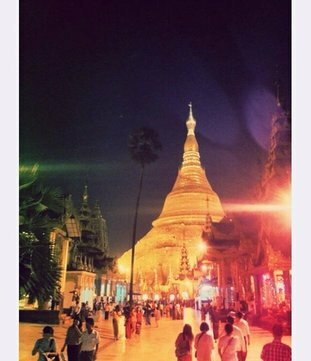 On any list of top things to do in Myanmar, a visit to Yangon's Shwedagon Pagoda must rank highly. This sprawling symbol of Burmese Buddhism is more than a single temple; the complex instead resembles an entire small town set aside for worship. 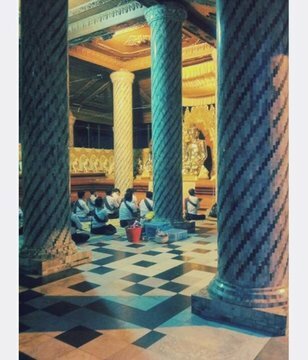 Depending on which reports you believe, Shwedagon has either been around for just over 1500 years or for over 2600 years. Either way, this ancient holy site has experienced its fair share of traumas over the years, in the guise of wars, earthquakes, political upheaval and general neglect. 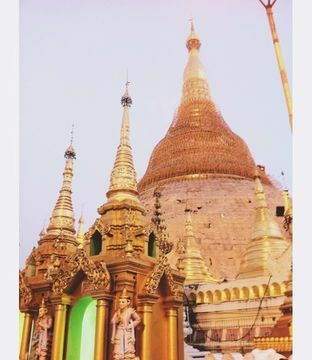 Despite this turmoil, the magisterial structure you see today has become Myanmar's foremost pilgrimage destination, as well as one of the country's best loved tourist attractions. 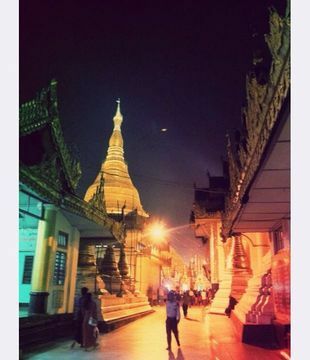 I approached Shwedagon Pagoda in late afternoon, hiking the few miles north from my hotel in downtown Yangon. I'd only been in the city a few hours and had handily misplaced my brand new map which resulted in a number of random detours down side-streets and by-ways as I attempted to tack north-west to the place I thought the pagoda might be found. After briefly being distracted by a flashing neon sign which promised me a "Myanmar Draught Beer Experience" I discovered that I was at People's Park – a park I remembered from my taxi ride from the airport as being just to the west of the pagoda itself. It was 17:45, and I was just in time. Arriving at Shwedagon Pagoda in daylight is an odd experience. Walking between two enormous plastic leogryphs – the lion statues that traditionally guard the entrance to Burmese temples – and stepping bare-footed onto an escalator can't help but make you feel a little… well, maybe disappointed is the wrong word, but certainly a little underwhelmed. Stepping off the escalator and onto the marble of the main plaza, still warm from the brutal sun of a Burmese afternoon, the feeling of bemusement continued. The place was packed, noisy and certainly not the oasis of calm you might expect from such a holy monument, and the tacky halos of neon lights that encircle the heads of the Buddha images seemed awkward and incongruous. The sun was still well and truly up as I circled the enormous, 368ft stupa at the centre of the complex, and as I heard the "bleep bloop" of the train station-esque Tannoy announcement, I resolved not to stay here very long. As the sun dipped below the western horizon, its sharp horizontal rays lit up the golden stupa like a gilded diamond. The lengthening shadows on the ground wrapped themselves around the architecture and the people, creating an anticipatory atmosphere that couldn't help but make my pulse rise just a little. And the sky kept changing. What had been the sharp blue of mid-afternoon quickly became tinged with the red tones of twilight, before becoming even deeper, morphing into a soft purple and blending with the haze of the incense smoke. The sound of chanting rose from every corner of pagoda complex and the sensuality of the scene became almost overwhelming. I'm no Buddhist, and I have enough respect for the religious beliefs of others not to ignorantly dip my toes into an ancient set of codes and practices whenever it suits me, so I simply found myself a quiet place to observe and let it all be. It was as I was reflecting that I began to scold myself for my attitude on arrival. I felt ashamed of my own "bourgeois, western traveller" disappointment that I felt on discovering the pagoda was not some quaint, tumble-down relic of a bygone age, where I could take some nice photographs and walk around and "ooh" and "ahh" at its unspoilt beauty. Shwedagon Pagoda is a living, breathing, religious site which continues to have immense cultural significance for millions of people in Burma and beyond; it is not some Dharmic theme-park for travellers to live out their oriental fantasies. I reckon I spent about two hours there, wandering the complex, gazing up in awe as the very structure of the stupa seemed to alter with the changing light, and taking in the various other temples and religious buildings that are dotted around the plaza at the foot of the stupa. It was a humbling experience and not something any visitor to Yangon should miss out on! 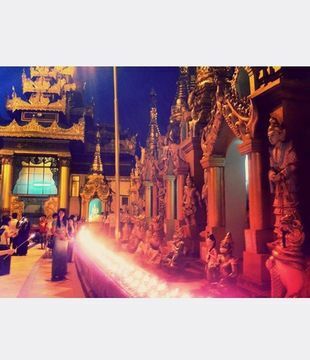 After a couple of hours spent in spell-bound awe, I left via the western gate and collected my deposited flip-flops, before heading off into the Yangon evening in search of that tantalizing "Myanmar Draught Experience" sign.